Here, you can find out everything you need to know about the first totally unique intercontinental travel companion that won’t get in your way once you’re back home. “FREITAG’s truck tarp isn’t suitable for large travel bags – it may be robust, but it’s just too heavy.” That was the main gist of my handover meeting in early 2016, when I began my new role as a product developer for travel and bicycle bags at FREITAG. Back then, FREITAG’s travel bag range was pretty small: it consisted of the F512 VOYAGER, a good option for hand luggage, and two sizes of toiletry bag. 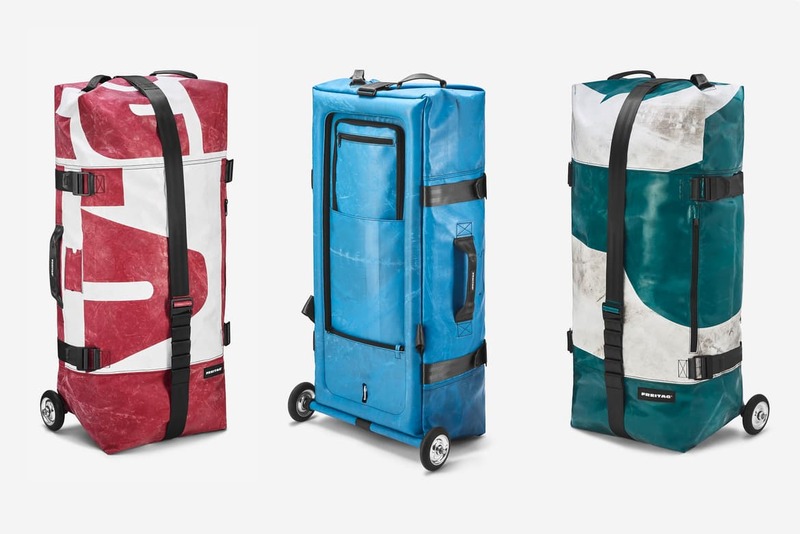 I was convinced that no one would take us seriously as a travel bag manufacturer, even though our recycled truck tarp is perfect for traveling – you can recognize a unique FREITAG bag from the other side of the arrivals hall. The only problem was the weight. Luckily, FREITAG already made bicycle bags that incorporated seatbelt straps and bicycle inner tubes alongside the usual recycled truck tarp. Those were what gave us our lightbulb moment: sewing in an inner tube to provide support instead of relying on a bulky metal frame solved the weight problem. Not only is the inner tube much lighter, it can also be deflated when not in use, saving tons of space until your next trip. 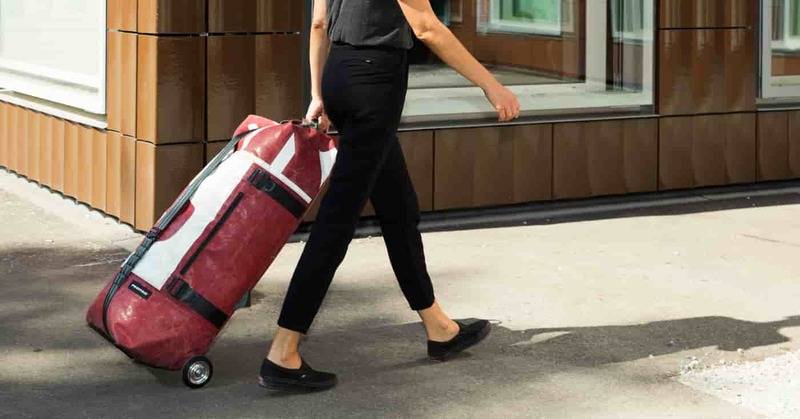 Fitted with stunt wheels from a kickboard and quick-release axles from a wheelchair, the first FREITAG travel bag was ready to take off. Once rolled up, it takes up less space than Gwen Stefani’s beauty case. In order to sniff out the market potential of this unconventional invention before we transformed countless square meters of valuable tarp into voluminous bags, we decided to launch the idea via a Kickstarter crowdfunding campaign in autumn 2017. It only took 12 hours for us to reach our campaign goal, and 30 days later, over a thousand keen travelers had pre-ordered their very own inflatable travel bag. Half a year later, the first unique F733 ZIPPELINs left our production hall and made their way to our loyal travel fans (hi, Yoshitomo! ), ready to be wheeled around the world. At the end of 2018, the last F733 ZIPPELIN travel bags were delivered to our campaign backers and today, FREITAG’s inflatable travel bag is finally available to all the globetrotters out there. In selected F-Stores, you can even choose yours using a special 80s-style arcade machine. Enjoy F-inding and pumping up your bag! ZURICH NOERD, BASEL, LAUSANNE, BERLIN, COLOGNE, HAMBURG, MUNICH, DÜSSELDORF, FRANKFURT, VIENNA, MILAN, ROTTERDAM. TOKYO-SHIBUYA, BANGKOK and CHIANG MAI and, from March, the reopened FLAGSHIP STORE ZURICH.